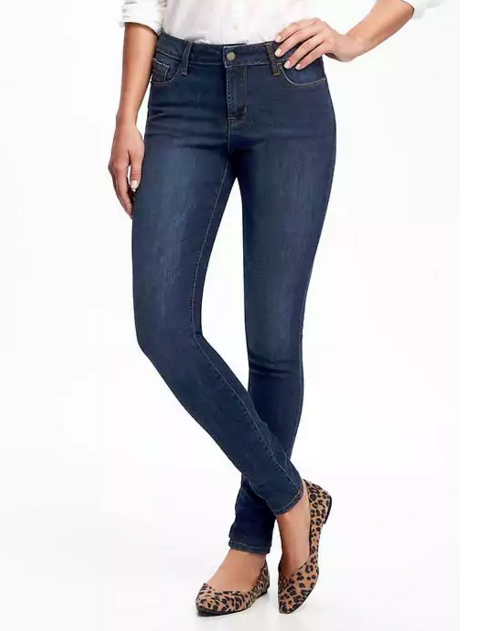 A good pair of skinny jeans is a staple in most of our closets; denim trends come and go, and while we've certainly seen a movement toward wider-leg styles in the past couple of years, a good skinny is something many of us reach for from time to time. The most challenging part of shopping for skinny jeans is finding a pair that actually feels as good as they look. Oftentimes, the skinnier the fit, the tighter the fabric—which can make the waist feel just a little bit too cinched. So when we spotted blogger Emily Henderson's (pictured above) glowing review of Old Navy's rockstar skinny jeans, our eyebrows raised. "VERY COMFORTABLE," she writes in all caps. "I wrote down 'really comfortable Saturday jeans.'" "So comfortable and great stretch. I bought them in a second color!" "They are comfortable for all-day wear." "The fabric is thin, but they are super comfortable, flattering, and look nice." "They are so comfy and keep their shape." Maybe the best part? They're currently on sale for only $29. Comfortable, flattering, and affordable? Yes, yes, and yes. Keep scrolling to shop the jeans now!